Those in the Bluff Creek area are taking this news hard. Everyone who was alive and there during the historic “first Bigfoot events” at Bluff Creek in 1958, have now died. An entire generation of observers, seekers, and bystanders have passed away. These include Al Hodgson (d. 2018), John Green (d. 2016), Ed Patrick (d. 2009), Bob Titmus (d. 1997), Tom Slick (d. 1962), F. Kirk Johnson Sr. (d. 1963), Kirk Johnson Jr. (d. 1968), and Ray Wallace (d. 2002). The Ray Wallace hoax revelations in 2002 led to exposés linking various friends & contractors to Wallace’s hoaxing & pranking. One set of Bigfoot tracks were fakes (as claimed by Wallace associates) vs Jerry Crew’s genuine Bigfoot print finds . Now the last one standing is gone. 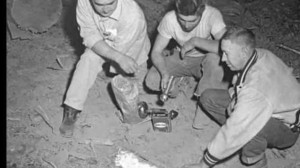 Jay Rowland, 86, who worked for the Wallace Construction company, and was on Jerry Crew’s crew in 1958 when the “Bigfoot” incidents occurred, has died. 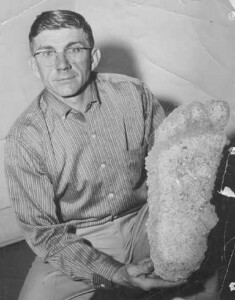 In 1965, Jay Rowland found Bigfoot tracks along Bluff Creek a short distance from Notice Creek, in northern California. J. R. Rowland passed away on February 12, 2019 with his faithful dachshund, Tiger. Jay was born January 27, 1933 in Danville, Arkansas to Robert Bennett and Mittie (Caire) Rowland. He is preceded in death by his loving wife Toots of 65 years; son in laws Donald “Mooney” and Rodney “Big R” Trimble; his parents and brothers, Charles (Cotton), Bobby Joe, and George; his sisters, Ruby Potts, Nettie Faye Rowland, Nina Gist, and Betty Avery. Jay is also survived by his daughter Laura Trimble of Hoopa; son David Rowland (Karmon) of Anderson; and daughter Cathy Danel (Lonnie) of Willow Creek; sisters in law Vivian Miller, Janis Howard and Annie Rowland; brothers James, Ray Lee and Ricky; and sisters Lois Robinson, Virginia Joshlins and Wanda Standridge. 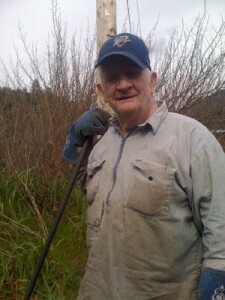 He is survived by his 11 grandchildren, Missie Ammon (Roy); Julie Trimble (Nick); Adam Trimble (Trish); Erick Trimble; Jeremy Trimble (Misty); Lena Trimble (Brian); Scott Rowland (Jennifer); Brandi Holloway (Curtis); Jacob Rowland (Jillian); Justin Danel (Angie); and Travis Danel (Brenda). He is survived by his 18 great grandchildren, Chauncey Ammon; Jessica Allen (Kayla); Nick White; Dayton & Ishi Trimble; Dylan & Delainy Sorrell; Maya and Ryke Trimble; Jaxon, Ava & Kenzie Holloway; Meredith & Kylie Rowland; Alexia & Maximus Rowland; and Isabelle & Raylan Danel; and one great-great-grandson, Paxton Allen; and numerous other relatives. He was eagerly awaiting the arrival of a new great-grandson and great-granddaughter, both due this coming summer. Jay moved to the Taft area in the early fifties as a young man looking for work in the oil fields. He met his wife Toots there and fell in love with his best friend. In 1957 they relocated their family to the mountains of Willow Creek. 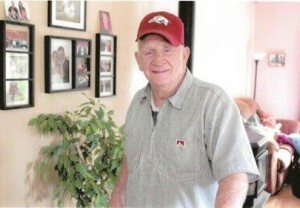 He loved living in the mountains and made his living as a logger and heavy equipment operator. He was happiest when he was operating heavy equipment, which included D7 and D8 caterpillars, loaders and road graders. He worked for many different logging and construction companies which include the Wallace Brothers Construction, where he formed a lifelong friendship with Shorty Wallace, Humboldt Fir, Galt Logging, O’Connell Logging, and finished his career with McIntosh Construction Company. Jay enjoyed sharing his experiences with the Bigfoot legend and had been interviewed many times and mentioned in numerous books. He was asked many times to take Bigfoot researchers into the Bluff Creek and surrounding areas to share his experience of the Bigfoot legend. He loved sharing stories with others of the good old logging days of his youth. Many times throughout the years his expertise working with heavy equipment was used on highway construction jobs, building roads into the wilderness areas and fighting forest fires including the Hog Fire on the Salmon River in 1977. During the 1964-65 flood, he along with a lot of other local men, were recruited to help with the evacuation of flood victims, working on restoring roads, and anything that needed to be done during that devastating period. A Celebration of Life will be held on Sunday, March 17, 2019 at the Salyer Wayside Chapel at 2 p.m. Please feel free to come and share your memories of our Dad and Granddad. The obituary above was submitted on behalf of J.R. Rowland’s family.